1/11/10 - McGwire Admits to Steroid Use - Mark McGwire has confirmed what most of the baseball world has suspected for a decade or so by admitting to steroid use throughout his baseball career. He remains one of a select group of players from the past two decades not to have lied about being clean and becomes one of an elite few who admitted to his misdeeds without someone holding hard evidence against him. While McGwire's character remains commendable, several points about his confession leave a bad taste in the mouth. McGwire said that steroids were "readily available" as early as 1989, which may open the eyes of some people who believe that the Steroid Era did not begin until the mid-to-late 90s. The Beginning - The St. Louis Brown Stockings were founded in 1882 as part of the American Association. After one season, they became known as the Browns. Later Developments - In 1892 the Browns joined the National League. They would later be known as the Perfectos before adopting the Cardinals moniker for good in 1900. Best Trade in Team History - In 1997, the Cardinals sent Eric Ludwick, T.J. Mathews, and Blake Stein to the Athletics for Mark McGwire. Ludwick, Stein, and Mathews would accomplish little while McGwire had one of the great seasons in baseball history in 1998. Worst Trade in Team History - In 1972, after he won 20 games but had a league average ERA, the Cardinals shipped Steve Carlton to the Philadelphia Phillies for Rick Wise. In '72, Carlton won 27 games, posted a 1.97 ERA, and struck out 310 Ks to win the pitching Triple Crown and the first of four Cy Youngs he would win with the Phillies. Not such a Wise move after all. Runner Up - In 1980, the Cardinals traded Rollie Fingers, Ted Simmons, and Pete Vukovich to the Milwaukee Brewers for Sixto Lezcano, David Green, Lary Sorensen, and Dave LaPoint. The four they got would never amount to anything, while the three they sent would win a combined two Cy Youngs and an MVP over the next two seasons and lead the Brewers to the World Series in 1982, where appropriately enough they would lose to the Cardinals. Remember Mark McGwire and 1998? The incomparable Albert Pujols has a fully healthy right elbow for the first time since 2002. Even though Pujols has never led the majors in home runs or RBI and has only led in batting average once, he is the best chance our generation has seen to win the National League Triple-Crown. Unfortunatley, the talent surrounding him may not be enough for the Cardinals to make the postseason, just like McGwire's 1998 squad. 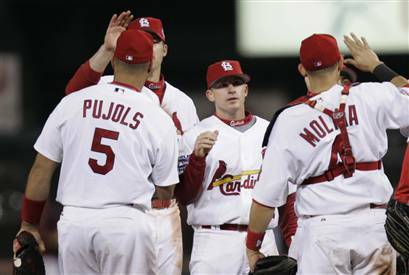 Can the Redbirds overcome injuries and rebound in '08? Many people will predict the Cardinals' demise this year. Is Keith among those prognosticators? Where does Lou Brock's fabulous 1971 season rank among the all time great leadoff seasons? A tribute to Hall of Fame broadcaster Jack Buck is now available at the Baseball Evolution Store. Betting strategies when you have the opportunity to hedge a season-long wager. Keith can't understand why the Mets are so highly favored here. Asher predicts a sweep in the Divisional round. Asher forecasts continued success for the NL's hottest franchise. Max Carey was a good hitter, excellent fielder, and the best base stealer for the first 100 years of organized baseball. Lou Brock was one of the worst outfielders ever, a marginally effective hitter, and a great but not legendary basestealer who happened to hold the all-time steals record for a dozen years before Rickey Henderson grabbed it in half of a career. "Go Crazy, Folks! Go Crazy!"